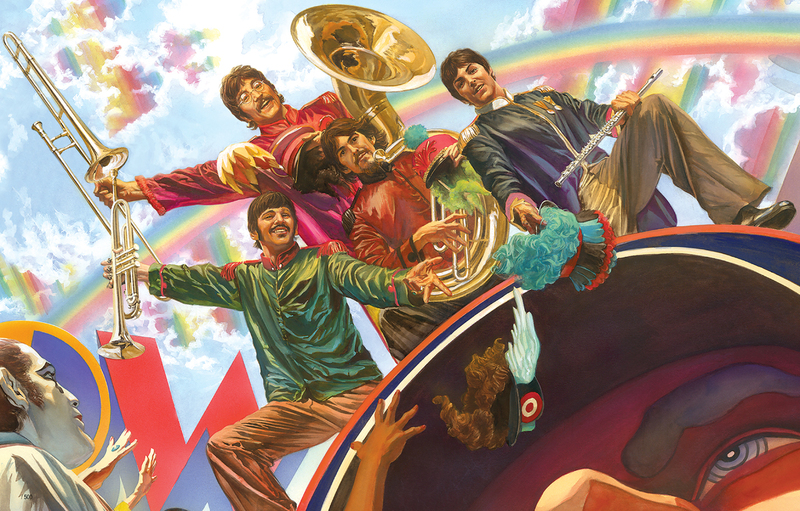 The NEW Alex Ross Art Collection: How Alex Ross and his team created an art program with Marvel, DC, Beatles, and more! Lots has been happening in the world of the superhero, and now is the perfect time to update fans of superhero art! Have you seen Captain America: Civil War yet? 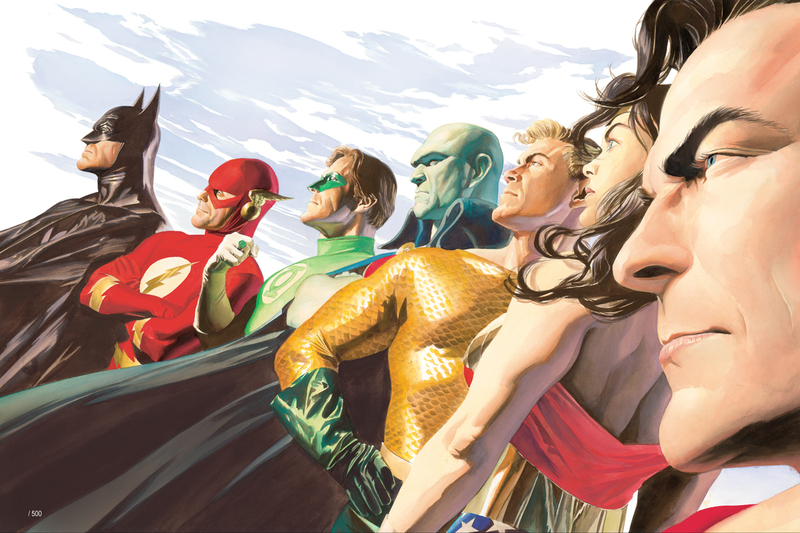 Well, surprisingly timely is the roll-out of the new Alex Ross art collection, and it’s just getting started. We are happy to be part of their team of galleries, and one of only three with the first assortment actually physically in the gallery, so you can get your eyes on the art. You may be wondering what all the fuss is about, since Alex Ross art has been available to fans since the days of the Warner Brothers stores. Don’t worry, I’m here to explain it to you. 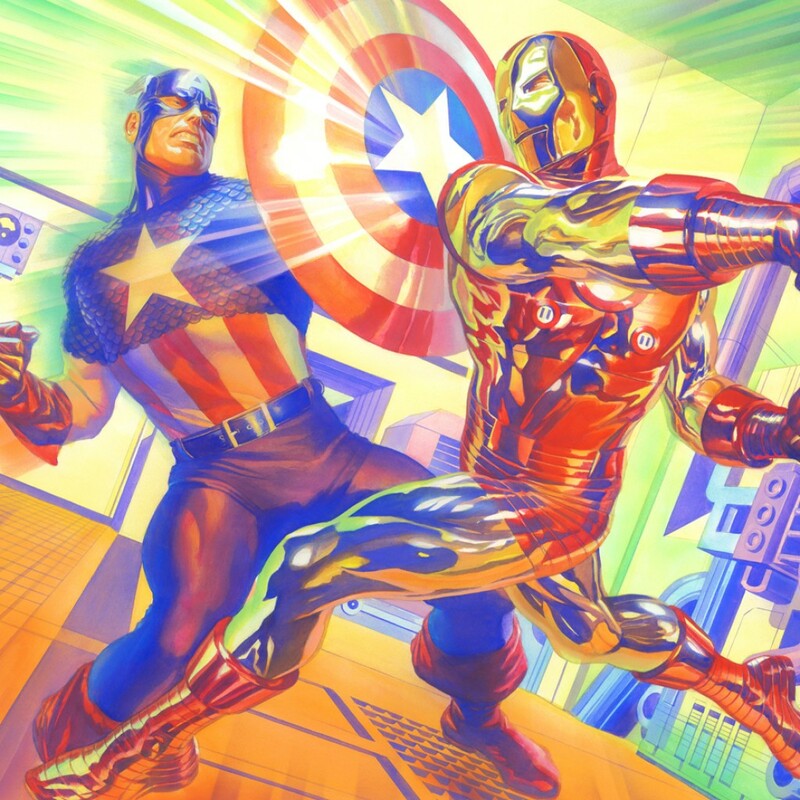 Those of you who have been following the career of Alex Ross, who of late has had exhibits in the likes of the Warhol and Rockwell museums, and has been placed in national museums around the world, know that Ross has been one of the very few comic book and pop culture illustrators to help break that art into the “real art” world. This is actually a big deal, especially for those who believe the work by the creators of comic books deserve artistic recognition like me. The story behind how Ross and his own team started a new art program is pretty innocuous. Apparently he just wanted control of his own artistic destiny, and they figured now is the time. The company that first sold his art was Clampett Studio, which is run by people who basically made him famous through his exposure in the Warner Brothers stores. In fact, Clampett Studio, and the artists they represent, should absolutely be on your radar and here’s why: Clampett Studio, which is run by Ruth Clampett, the daughter of famed Warner Brothers animator Bob Clampett, is the one company that sells art of the comic books, cartoons, and film that only sells art created by artists who actually work on the movies. THEY ARE THE ONLY ONE. and what’s more, they support the artists. Once someone works with them, they never look back. If you love the art of Alex Ross, you partially have Ruth Clampett and those who work with her to thank. As i mentioned, she still has art by Alex Ross available, but those signed by him are selling out fast. We can access and sell you anything on her website, and I urge you to support her artists and collections. Jim Lee is still part of her assortment, for example, as is all the OFFICIAL art of Harry Potter. You can dive into the Alex Ross works available HERE. For all the assortments on Clampett Studio, go HERE. So, back to this new Alex Ross collection….they decided to take the reigns back and start their own art program. Normally, Warner Brothers wouldn’t let an artist make a decision like that, but this is Alex Ross. Now that they’ve taken the art program in-house, and with a big splash in Los Vegas with a release of Beatles art, they are forging forward. 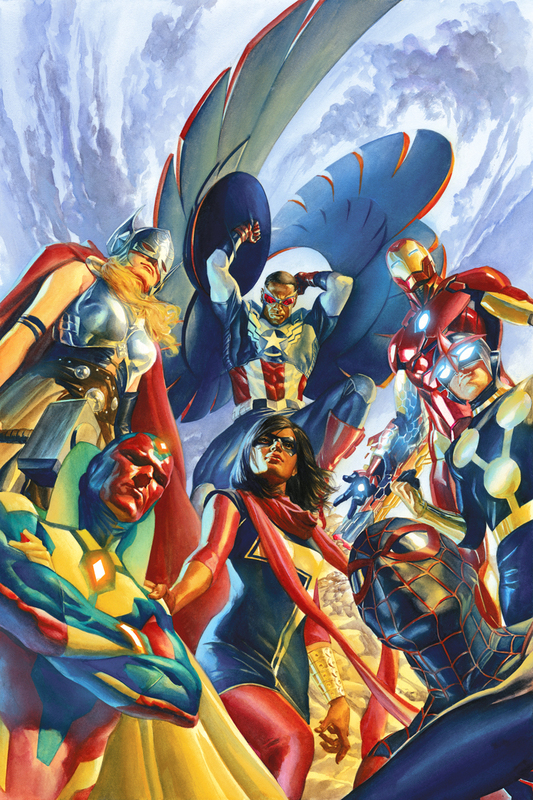 The person in charge of their art program is an old friend, and I am absolutely 100% behind her and the Alex Ross Art program, because she always knows how to build a great collection, limit releases, and consider the collector. She is a fan, and a fan who knows the business is the best person in the world to create a lasting collection of art. Now might be a good time for full disclosure. I haven’t always loved all of Ross’s work. I think some of it looks very frenetic, and too full of color. Yet, somehow, the new work has a calmness, a grace to it, that rises above much of the art i’ve seen before. For example, limiting the color palate in this collection of four images and making them a series that visually complements each other was brilliant. 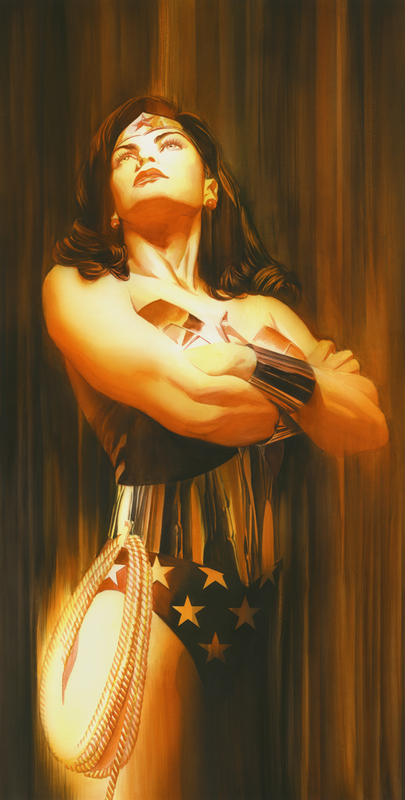 Also, the painting of Wonder Woman is, to my mind, one of the best pieces he’s ever done. The crazy thing is, it’s in an edition of only 50. I assume it’s because they want their first pieces to blow through and succeed with a sell out. YES! What does all this mean for you? It means great art, well curated, considered, and controlled. The first release was impressive onscreen, but when it came in, I was gobsmacked. ESPECIALLY the Wonder Woman and the Captain America v Iron Man. If you’re in the area, come in and see the art. Also, I forgot to mention there are several pieces that are only $150, and on canvas, representing both DC and Marvel. I am sorely tempted to buy some of it myself! Lastly, although it’s likely you won’t have access, we WILL be getting some originals by Alex to sell. While you can get art directly from his company, they will be releasing special production graphites that won’t be available through them that you can get from the galleries. Not only is this a great sign they are committed to the galleries, it also means we can get wonderful original art for his fans! Meanwhile, contact ArtInsights if you have any questions, or are looking for particular characters. We’d also love to hear from you about what you thought of CAPTAIN AMERICA: CIVIL WAR. To get you all the more excited, here’s Cinema Siren’s review, which includes interviews with both Chris Evans and Robert Downey Jr.
AND if you want to see all the new Alex Ross art for sale at the gallery, go HERE! Thanks and until next time, LET’S GO, CAP!